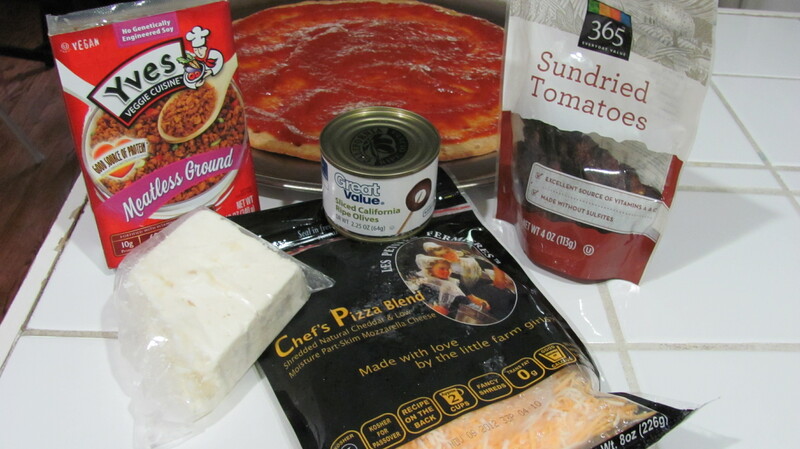 Posted on August 29, 2012 by Michele D.
A few days ago, I blogged about my Substitute for Flank Steak Flop. 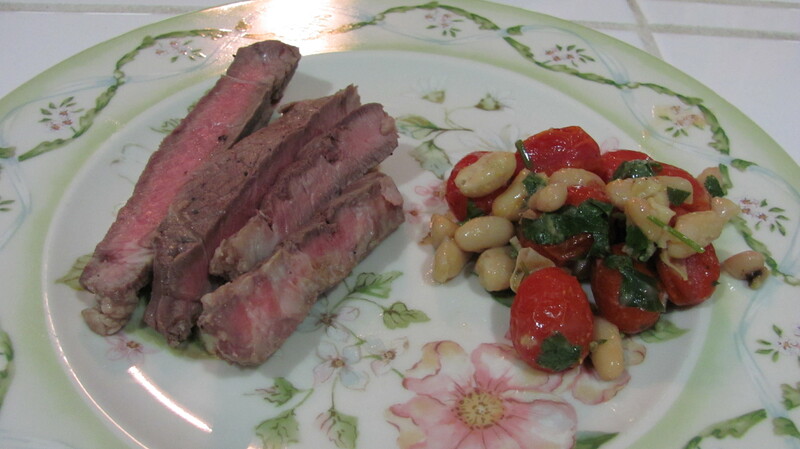 I was attempting to make a recipe for Flank Steak, tomatoes and white beans and used Boneless Beef Chuck Steak to replace the non-kosher flank steak but unfortunately, the meal did not turn out very well. The meat was bland and tough. Needless to say, we had lots of leftovers. I’ve been trying to think of something to do with these leftovers when I realized this morning that we were out of dog food and since I don’t have time to go to the store until later this evening, guess what our sweet little Golden Retriever, Mimi, is having for lunch today? 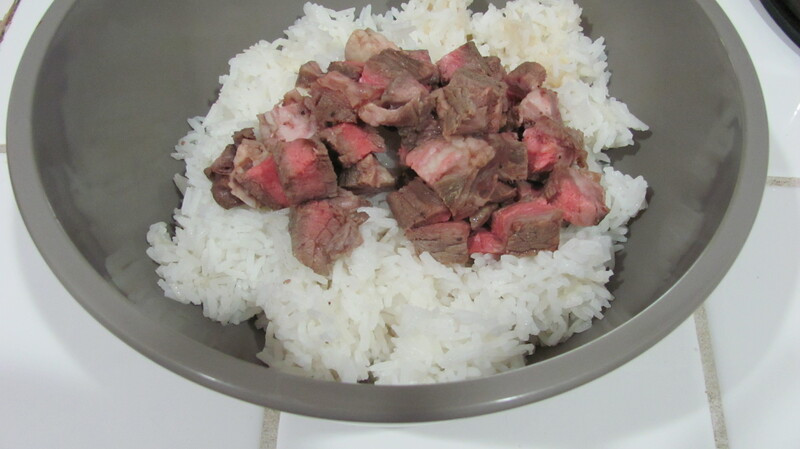 I made a cup of plain rice, chopped up the beef and mixed it all together. It took Mimi about 2 minutes to eat the entire bowl of leftovers and she didn’t complain one little bit. So I guess the moral of this story is that if it’s next to impossible to “save” a bad dish, there’s probably a hungry dog somewhere around who would love a nice, kosher meal! Posted on August 28, 2012 by Michele D.
My goal for this week is to make dinners using only the food I already have in my pantry, refrigerator and freezer. Most weeks, I make several trips to the grocery store when there is a ton of food already in my house that seems to never get used so I’m going to make a dent in my stored supplies this week. For dinner last night, I made a meaty, meatless pizza and a simple kale salad … because as you know, I’ve become a big fan of kale recently. Pizza sauce leftover from Passover … yes, I know that’s ridiculous but I still had a can of kosher for Passover pizza sauce. In the past, I’ve also used a simple spaghetti sauce as well. 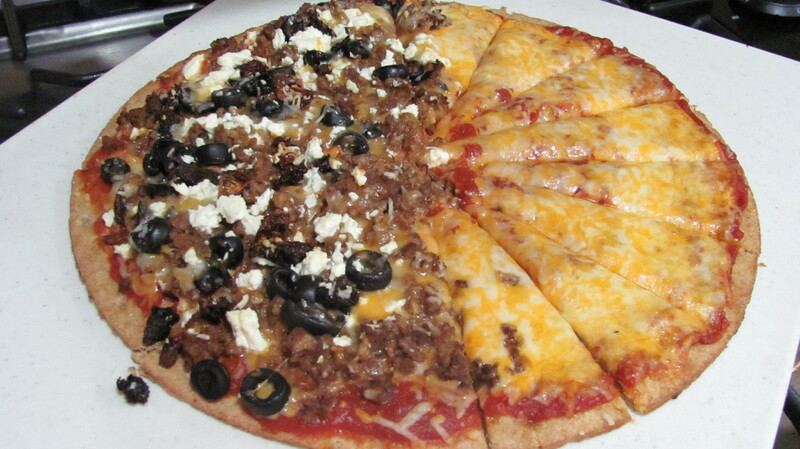 I made 1/2 of the pizza cheese only for my picky 6-year-old and piled the other half high with the above ingredients by layering first pizza sauce, cheese, meatless ground round, olives, sundried tomatoes (chopped up into small pieces), and then a final layer of pizza cheese topped with a bit of feta. Whisk together lemon juice, mayonnaise, olive oil, Dijon mustard, and 1/8 teaspoon each salt and pepper in large bowl. Remove ribs and tough stems from kale; thinly slice leaves. Add kale to bowl with dressing along with chopped apple and walnuts; toss to combine. My husband didn’t love the Kale Slaw and I didn’t like it as much as the Kale I’ve cooked in the past but it started to grow on my after a few bites. The leaves were a bit chewy so I’m thinking it might have been better if I’d let it sit with the dressing for an hour or so before serving. All-in-all, it was not a bad dinner, especially considering I didn’t have to make a trip to the grocery to store prepare it. What’s in your kitchen that you could make a meal from tonight? Posted on August 26, 2012 by Michele D.
As I’ve mentioned before, I don’t cook with beef very often. It’s not that I don’t like beef. I just don’t really know what to do with it so I avoid it. But a recipe in the latest issue of Woman’s Day magazine caught my eye and included, you guessed it, beef – Flank Steak, Tomatoes and White Beans. The recipe is in a section called Time-saving Dinners and offers suggestions on how to prep a few extra ingredients when you are making “meal 1” to simplify the process for making a second meal the next day. The recipe for Flank Steak (Meal 1) sounded healthy and as usual, I thought as long as I follow the recipe exactly, the beef part will turn out fine. So off I went to the Kosher butcher with my list of ingredients. I asked for my Flank Steak and once again, said butcher snickered a bit (this is starting to be a pattern when I shop for Kosher beef). “Um ma’am, flank steak isn’t Kosher.” But I know I saw Flank Steak on the Kosher Coop’s web site. “No ma’am, you probably saw Flanken, which is beef bone, not actual meat.” Oh, well you could be right I say. So what can I use as a substitute. “Skirt steak,” he tells me, with a look in his eyes that says, please get your lack-of-kosher-beef knowledge self away from my counter so I can help other customers. I looked at the skirt steak and decided it didn’t look very good. But rather than get into another discussion with the butcher, I decided to take matters into my own hands. I chose boneless beef chuck steak mainly because, well it was pretty. I’ll say the Pro of this recipe is that it was fairly quick and easy to make. I didn’t prep the extra ingredients to make Meal 2 – Sweet potato, steak & bean tacos with roasted tomato salsa – but maybe I can make something similar with the leftovers. Make the roasted tomatoes: Heat oven to 425 degrees F. On a rimmed baking sheet, toss the tomatoes and garlic with 2 tablespoons oil and 1/2 teaspoon each salt and pepper; roast for 6 minutes. Add the wine and beans and mix to combine. Roast until the tomatoes have begun to burst and the beans are heated through, 5 to 7 minutes more. Toss the tomatoes and beans with the parsley and serve with the steak. So what would you have done differently to spice up this recipe to make it taste better? And, what would you do with the leftovers to make a meal that your family would want to eat? Posted on August 22, 2012 by Michele D.
1 1/2 cup(s) (about 6 ounces) shredded, cooked chicken-breast meat (This was the tricky ingredient. I checked the Quorn and MorningStar meatless chicken strips and neither were Kosher. I ended up buying WestSoy Seitan Strips and Home-style Tempeh Spicy Veggie both of which are Kosher Parve. I taste-tested both before mixing them into the recipe and ended up using the WestSoy Seitan Strips, which tasted very similar to chicken. I was not a fan of the Tempeh Spicy Veggie at all but maybe I can find another use for it in the future. 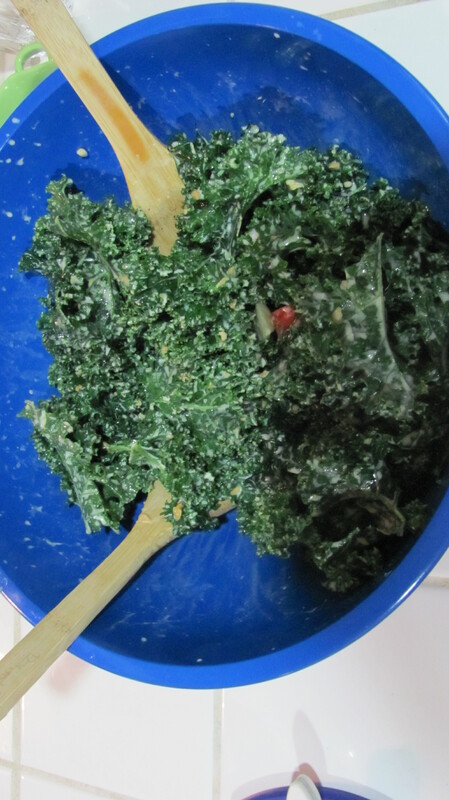 Place kale in microwave-safe medium bowl along with 1/2 cup water. My microwave stopped working months ago so I just steamed the kale on the stovetop until tender. Cover with vented plastic wrap and microwave on high 8 minutes or until kale is wilted and tender. Drain; let cool slightly. Wrap tortillas in damp paper towels. Microwave on high 1 minute or until warm and pliable. (Once again, no microwave for me means I skipped this step completely). Place 1/2 cup chicken mixture in center of a tortilla; roll up tightly. Place, seam side down, in baking dish. Repeat with remaining tortillas and chicken. 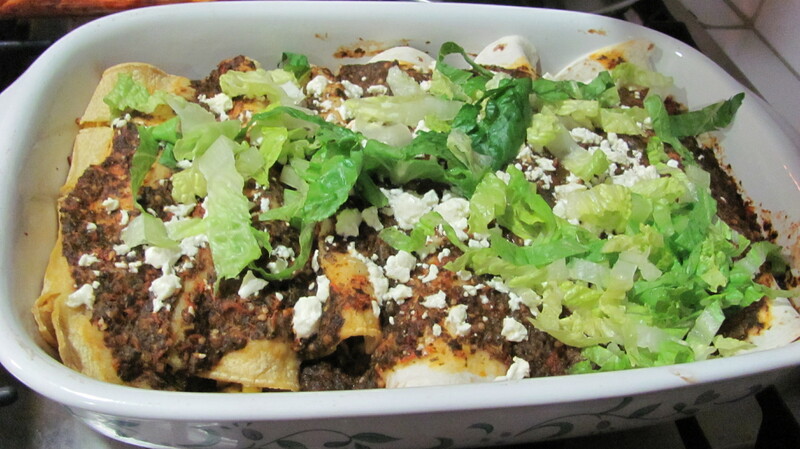 Top enchiladas with remaining vegetable purée and feta. Cover with foil; bake 20 minutes or until heated through. 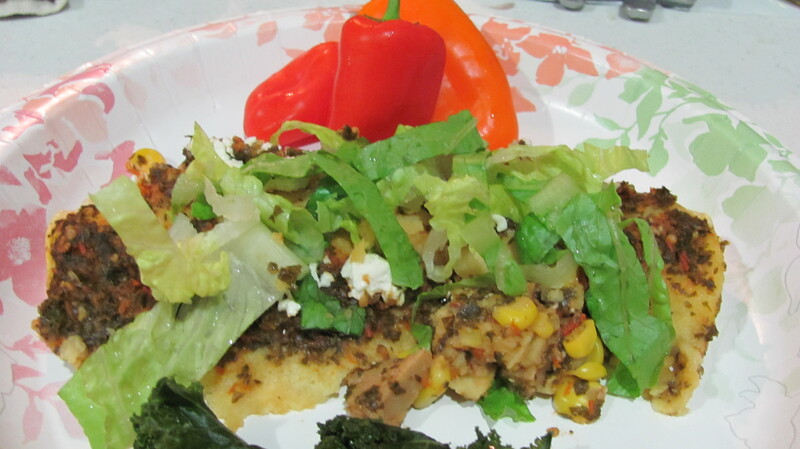 To serve, top with lettuce and cilantro. In addition to the Chicken and Corn Enchiladas, I also made a simple cheese enchiladas version for my daughter because I was afraid she would refuse any food that contained so many vegetables. I was right. So she happily ate her plain cheese enchiladas while I pretended I was eating my treif chicken enchiladas mixed with feta cheese. The WestSoy Seitan Strips truly did taste like real chicken and the sauce … yes I’m talking about it again … was out of this world. This is a kosher vegetarian recipe worth trying. Just make sure you have plenty of time for prep work and cooking! Posted on August 21, 2012 by Michele D.
We recently started a new “tradition” in our house – the pre-Shabbat cocktail. Now, I’ll admit I’m not sure if this is a good or bad or even “kosher” habit to start but after a long, stressful week, it’s fun to mix-up a nice cocktail and make a La Heim to kick-off Shabbat. A few weeks ago, we tried the Shabbat Pina Colada thanks to a yummy recipe from The Kosher Eye. But one of our most favorite drinks is the Lemon Drop Martini, which was introduced to us by a friend in our community whose name I’ll leave out of this post to protect the innocent. 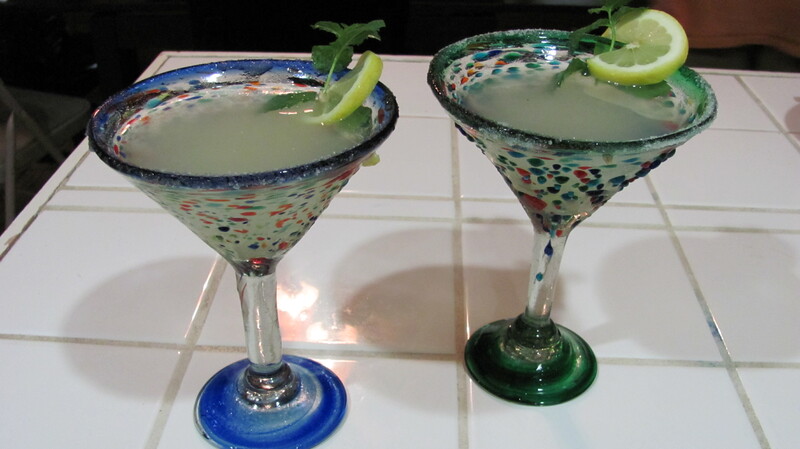 When we started mixing up these delicious martinis, we unfortunately did not have a good set of martini glasses. Our recent trip to San Antonio solved that problem thanks to a lovely store called Marti’s – Discover Mexico’s Treasures in San Antonio. This store has the most beautiful things from clothing to fine china to decorative items. We just happened to walk past it on our way back to the hotel from the El Mercado, where we had passed on similar martini glasses because of their $12.95 each price tag. We decided to take a chance and check the prices at Marti’s and to our amazement, these funky, handblown glasses were only $7.95 each. The most difficult part was that Marti’s has shelves and shelves of glasses to choose from. It was really hard to decided which ones we wanted. We finally selected blue and green glasses with small pieces of colored, confetti-like glass on the outside. After making our purchase, we happily headed back to the hotel with visions of Lemon Drops in our heads … OK, I might be going a bit overboard with that statement, but we were definitely excited about our new glasses. Mix the vodka, orange liqueur, sugar, and lemon juice and Mint Leaves in a cocktail shaker half-filled with ice; shake well. Pour strained liquor into sugar-rimmed martini glass and garnish with a twisted peel of lemon. To create a sugar-rimmed glass, take a lemon wedge and rub the drinking surface of the glass so it is barely moist. Dip the edge of the glass into the superfine sugar. I pour a bit of sugar into a small paper plate and then slowly spin the glass edges in the sugar. It works great to quickly make a sugar rimmed glass. Makes 1 serving … which we usually end up doubling … a few times over. Happy Kosher Treif Cooking … and La Heim! 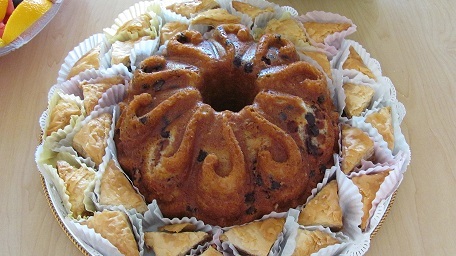 Posted on August 20, 2012 by Michele D.
Check out Safta’s beautiful and yummy chocolate banana cake and baklava that she served at her son’s (my brother-in-law’s) going away party yesterday. Both were lovely and delicious. I don’t have a recipe to share but I’m sure she could be persuaded to divulge her secret if we beg. 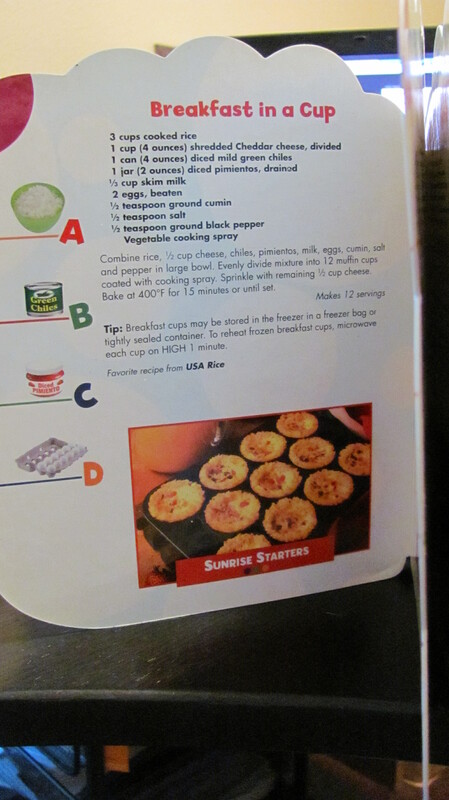 Posted on August 19, 2012 by Michele D.
We have a cute little cookbook called Kids Cooking. I can’t remember where I got this cookbook, but it’s the perfect size for little hands. Plus, it’s a board-type book so the pages are tough-enough to handle kids looking through the recipes without tearing the pages. Each recipe features a beautiful photo of the food along with an ABC list and pictures of the necessary ingredients. Yesterday during the very long Shabbos, Zoe was spending some time with the Kids Cooking Cookbook picking out what food she wanted for the upcoming week. One of her favorites was this Breakfast in a Cup recipe so I agreed to make it for her this morning minus the diced mild green chiles and the diced pimientos – 2 food items that she does not like and I didn’t have anyway so it worked out well for both of us. Combine rice, 1/2 cup cheese, chiles, pimientos, milk, eggs, cumin, salt and pepper in large bowl. Evenly divide mixture into 12 muffin cups coated with cooking spray. Sprinkle with remaining 1/2 cup cheese. Bake at 400 degrees F for 15 minutes or until set. I actually baked for 18 minutes total. As mentioned above, I left out the chilies and pimientos. I also mixed up 2 separate batches – 1 with plain rice and 1 with a cup of leftover spinach rice. I tried to divide the ingredients this way: 2/3 in the plain rice and 1/3 in the spinach rice, however, I ended up adding 2 eggs to both and a bit of extra milk to the spinach mixture because it seemed a little dry. It’s a very filling way to start the day and easy for kids to pick-up with hands and eat. Give it a try and let me know what you think. Tip: Breakfast cups may be stored in the freezer in a freezer bag or tightly sealed container. 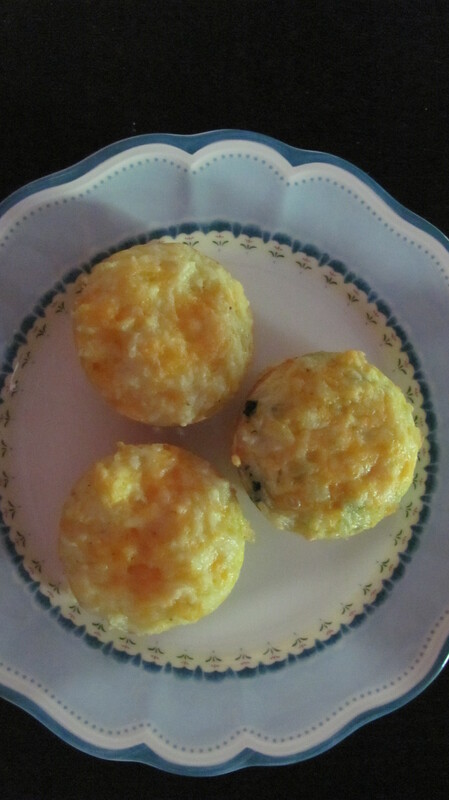 To reheat rozen breakfast cups, microwave each cup on hig for 1 minutes. Favorite recipe from USA Rice.